At the Central branch in Copley Square, the Boston Public Library offers free tours highlighting the architecture of Charles Follen McKim and Philip Johnson, as well as the many works of famed sculptors and painters. The McKim Building of the BPL, just a ten minute walk from our Boston bed and breakfast, is a strikingly memorable structure. Classic facade, a grand Entrance Hall, and a modest elegance contribute to its charm and serenity. The interior details give the building a constant flow of surprise and aesthetic exploration. Upon entering the vestibule, you face a unique trio of 1500 pound bronze doors, created by Daniel Chester French. The broad entrance hall boasts vaulted ceilings covered in a marble mosaic. The great twin lions, crouched on pedestals at the turn of the grand staircase, are the work of Louis Saint-Gaudens, memorials to the Massachusetts Civil War infantry regiments – the 2nd and the 15th. A gallery of the French artist Puvis de Chavannes’s murals inhabit the second floor corridor, heading into Bates Hall. A series of richly colored murals entitled The Quest of the Holy Grail cover the walls in the Abbey Room, on the south end of the Chavannes Gallery, a favorite of many visitors. The lobbies at either end of the Chavannes Gallery are richly decorated with elements reminiscent of Pompeii at the south end and Venice on the north. 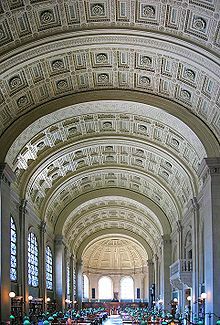 Boston artist John Elliott claims the namesake to the Elliott Room neighboring the study hall through the Venetian Lobby, due to his decor on the ceiling, entitled The Triumph of Time. The magnificent Bates Hall occupies the entire front of the building with enormous arched windows and a barrel vaulted ceiling. The great American painter John Singer Sargent spent years decorating the long, high walls of the Sargent Gallery with his Triumph of Religion mural. The absence of windows brings a somber tone to the powerful artwork. Through the south end of the Sargent Gallery is the Wiggin Gallery, originally devoted to the donation of a special print and drawing collection of the Boston-born New York financier Albert H. Wiggin in 1941. Since his donation, additional works of American and European artists of the 19th and 20th centuries call the Wiggin Gallery home. 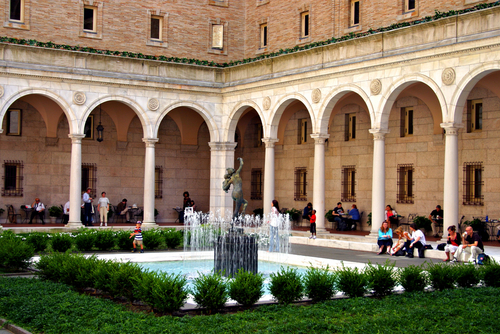 The McKim Building’s deep interior courtyard is a haven of peace in a busy city. An arcaded promenade rounds three of the outdoor walls, identical to the cancelleria Palace in Rome. A bronze cast fountain statue entitled Bacchante and Infant Faun lends a bit of whimsy in this picturesque outdoor space. A new addition to the Boston Public Library was opened in December 1971. Philip Johnson observed two specific requests in his design of the new building – to mind the existing roofline, and to use complimentary material to the exterior of the McKim Building. the McKim and Johnson Buildings are connected on three of the Johnson Building’s ten levels to provide access to the resources and public services of the library. Unique structural and mechanical systems were developed in order to contain nine floors and a mezzanine level within the high limitations of the neighboring McKim Building. Trying to think of things to do in Boston and want to experience the beauty and grandeur of the Boston Public Library for yourself? The volunteer staff at the BPL offeres free one-hour guided tours every day – but times vary each day, and space is limited. You can find more information on the Boston Public Library website. The historic experience at the Boston Public Library is seamlessly complimented by a stay at the Clarendon Square Inn. Our Boston boutique hotel in the South End neighborhood is in a carefully restored 19th century brownstone rowhouse with luxury accomodations offering unparalleled attention to detail. 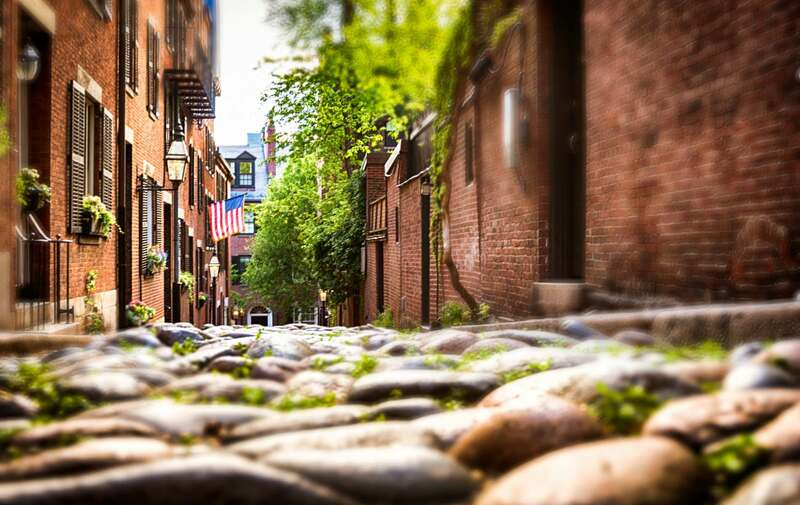 Let the team at Clarendon Square guide you in a discovery of Boston’s most hip and historic neighborhood! This entry was posted in Uncategorized and tagged art, bed and breakfast, boston architecture, boston boutique hotel, boston historic buildings, Boston Public Library, boston south end, copley square by admin. Bookmark the permalink.